They'll be stopping up the wine bottle but there'll be no stopping the memories each time your guests make use of these festive favors. Each 4 .25" x .75" x .75" favor has a sturdy metal core lined with a black rubber stopper rim topped with a stylishly-tilted leaf silhouette. From Fashioncraft's exclusive Vineyard Collection, each bronze metal wine stopper is packaged upright in a deluxe clear box with a fall design top and bottom allowing a dramatic 360 degree view of the favor, finished with a sparkling bronze organza bow and a designer leaf shaped thank you tag attached. We ordered 230 of these bottle stoppers on a Sunday, they were delivered on Thursday. Super happy with the quick turnaround. We were nervous at first because we weren't sure how legit this site was, but I'm so happy we took the gamble. The cute fall packaging looks awesome, everything came just as it looks in the photo online. Cute, well priced and made, arrived on time. We received so many complements about the Autumn Themed Wine Bottle Stopper. Finally, a favor that you know will be used and appreciated by your guests. The pre-wrapped gift boxes were a bonus treat. I will definitely use your company again. Beautiful!!! Just what I needed, great price, great packaging! These wine stoppers were ordered as a bridal shower favor. They were perfect, as they blended in with the fall motif. The quality was perfect and the packaging was actually quite nice. In fact, we had originally planned to wrap them, but when the favors came in and we saw the packaging, it was quite pretty just the way it was . We did purchase the additional customized gift tags, which was a great additional feature for very little extra money. Overall this was a great and well received favor. Very nice Wine Bottle Stopper along with packaging-great price and fast shipping. Will use for wedding favors at my daughters wedding in the fall 2017. 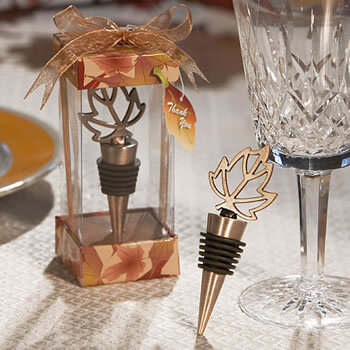 I bought the autumn wine stopper as part of a nonprofit year-end incentive basket, and everyone has raved about them. They are beautiful, functional, and an elegant addition to the basket. The copper color looks great! Very good value. Looks nice and the individual packaging is great (the bows are pretty flat and hard to get back in good shape after shipping, however, but not a big deal). We used these as favors for a Fall Gathering themed party. Turn around time from placing the order and delivery was great! The product quality was excellent! hope to have the opportunity to do business again. These autumnal wine stoppers arrived in perfect condition in a pretty little box. Everyone loved them! They went perfect with our Autumn Wedding theme. There was nothing to do but pop them on the table and they looked perfect! I was pleased with the quality and price of the autumn themed wine bottle stopper! I haven't used the favors yet, but they arrived AMAZINGLY fast! I hope my guests like it as much as I did. The bottle stoppers look the same online as when I got them in the mail. There were no surprises. It also match my wedding colors perfectly! We ordered 1200 of the these items and were very pleased with the order process, shipping process, and the the stopper. Great Gift Idea!!! These arrived in perfect packaging and quickly. The price is great and cheaper than other sites I looked at.